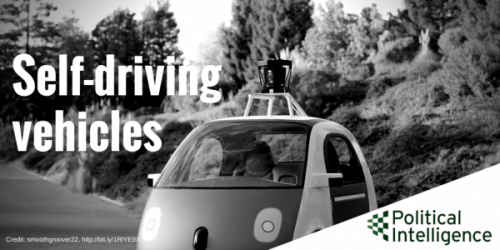 Self-driving vehicles – on the right track? If you were to design a personal transport solution today, unless you are Jeremy Clarkson, it is unlikely that you would create anything along the lines of the modern car: expensive to buy and to run, quick to depreciate, highly polluting, dangerous, and idle for 96% of its lifespan. Fortunately, a transport revolution courtesy of self-driving vehicles is fast approaching. The long term potential of fully driverless vehicles is truly staggering. They promise much, not just for avid texters and heavy drinkers, but for society at large, and city dwellers even more so. But getting fully driverless vehicles on the road will involve a host of legal, technical, policy and social challenges, from the impact on jobs and the need to build consumer trust, to infrastructure and regulatory challenges, and headaches for the insurance industry. The availability of real-time information, and rapid developments in computing, sensor technology, broadband, analytics and GPS tracking have already enabled significant advances in ‘assisted driving’ functions such as automated parking, robotic road surveying systems, cruise control and collision alert technology, thereby facilitating the wide availability of vehicles that offer a high degree of technological assistance to drivers – an important phase en route to fully driverless vehicles. Mass adoption of self-driving vehicles promises major environmental and safety benefits, reductions in congestion, improved labour productivity and a better quality of life. Rather than letting their asset sit idle for most of the day, owners will be able put their driverless vehicles to work whenever they aren’t using them – making them available for short term hire. An Airbnb-for-vehicles style model would undoubtedly emerge, meaning that far fewer vehicles would be needed to meet society’s transportation needs. Research by the Massachusetts Institute of Technology (MIT) has shown that by combining ride sharing with car sharing in New York—it would be possible to take every passenger to his or her destination at the time they need to be there, with 80% fewer cars. A stark reduction in the number of vehicles would not only reduce congestion and improve lessen journey times, but would minimise the need for parking, freeing up scarce inner city land for myriad other purposes, from housing, office space or agriculture to the restoration of green spaces. Perhaps the biggest impact would be on labour productivity. Less congestion, more efficient routing and faster journeys would mean less time spent commuting and free up time spent driving for more productive pursuits. Mckinsey have estimated the resulting productivity gains would be worth $5.6 trillion worldwide. Whilst the ultimate vision is for a car to drive itself without the need for any intervention from a human driver there are likely to be many stages on the road to fully autonomous vehicles. However, policymakers need to start thinking seriously about the likely ramifications. Despite much talk of glacial regulatory environments in association with new technologies – the UK is actually a pretty good place for those wishing to develop new technologies and put their case for a route to market. The Government has been relatively quick to identify the opportunities associated with the UK taking a leading role in the development of driverless vehicles and has pledged to amend national and international legislation to facilitate the production and marketing of highly and fully automated vehicles. The Chancellor’s last Budget confirmed plans to ‘establish the UK as a global centre for excellence in connected and autonomous vehicles’, with driverless cars to be trialed on UK roads by 2017, and a review of the regulatory barriers. The Government’s light touch, non-regulatory approach to the testing and development of these technologies has already paid dividend, resulting in the production of a Code of Practice that will soon facilitate long distance and large area public road testing of these technologies. There is a very welcome sentence in the Government’s review of driverless technologies published last year – an approach that policymakers and regulators responsible for other sectors dealing with disruptive innovation would do well to take note of, “The rate of technological progress in this area is high and it is important that this innovation is not stifled.” Long live this approach to disruptive technology. If this kind of talk matches up with the reality, it may turn out that for once it is consumers, rather than regulators, that are responsible for delaying progress. However, the policy challenges facing the widespread adoption of self-driving cars will not be insignificant, and will include job losses in some sectors, the requirement for specialised infrastructure and the need to develop new ownership, liability and regulatory frameworks. That is not to mention the thorny philosophical questions raised by “unavoidable crash” scenario’s in which decisions will have to be made (and algorithms written) regarding the prioritisation of life, eg. pedestrian vs passenger, or child vs group of adults. Whilst the technological foundations of driverless vehicles are well advanced, there is more to be done to ensure that consumers are receptive to the transition, and are helped to overcome natural fears around ceding total control to a computer when travelling at 70mph. Another challenge concerns the need for ubiquitous mobile internet coverage, without which the range and practicality of fully autonomous vehicles will be severely curtailed. The answer to the world’s deepening congestion and population challenges in regards to transport will not be solved by building more roads – it will be a case of developing smarter ways of using the roads we’ve got. Self-driving vehicles still have a long way to go, but some of the major technological challenges have already been solved – it is now for people, governments, regulators and cities to embrace driverless vehicles and integrate them into their surroundings.